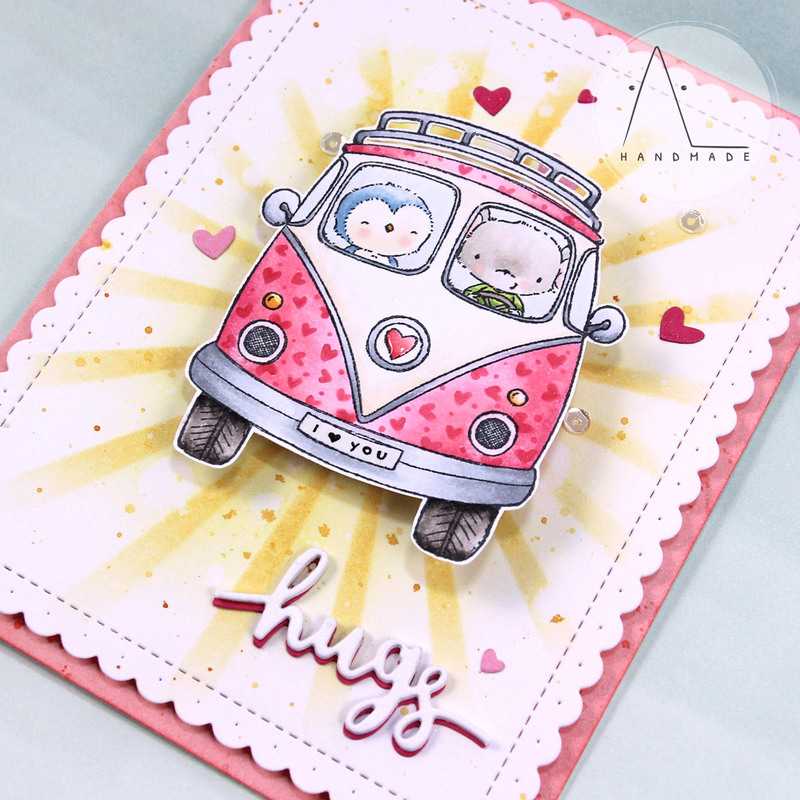 This project features the VW Bus, one of my favorite rubber stamps from the Happy Trails Collection by Purple Onion Designs. It was so much fun creating this card! I started working on this project by stamping the VW Bus image with Tuxedo Memento black ink and colored it with Copics. Once my base coloring was complete, I customized the bus adding some small hearts on it. I also wrote a small sentiment on the VW plate :) I must say that I love how it turned out. Next, I die-cut a panel out of white cardstock using the scalloped frame die from Chelsea Creative Cuts by Mama Elephant and ink blended some rays on it using Wild Honey Distress Ink over the Sun Ray Stencil by My Favorite Things. I also added some splatters on it to achieve a messy look. I ink blended some Abandoned Coral Distress Ink on a card base and foam mounted my panel on it. Then, I added the VW Bus on my front panel using a mini action wobble. So much fun and interactive! I die-cut the sentiment several times out of white cardstock using the “hugs” die from the Sentimental Ellements Die Set by Avery Elle. I stacked all the die-cuts together, adding a pink layer on the bottom of the pile – slightly off-centered – to create a shadow effect. Finally, I added some Wink of Stella to the Bus for shimmer, a bunch of hearts and some sparkling clear sequins as embellishment. Seriously, this card is too adorable for words! Makes me happy to look at it :) Thanks for sharing how you made it! Awww…two little critters going on a romantic get-away in the sweetest little VW camper, EVER! Love the hearts, the background rays, the hearts-and-hugs…everything! Once more, marveling at your creativity!